Nothing is more beautiful and unique than you! Is there someone in your life who doesn’t realize how beautiful they are? We all know a friend who needs to hear this…in fact, that friend may be YOU! 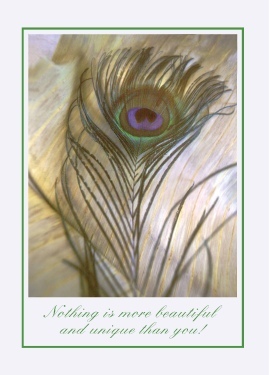 So this card is for all of you from me…Nothing is more beautiful and unique than YOU! We need to celebrate ourselves, our beauty and our uniqueness. Each of us is special in our own way and it’s so important that we treat ourselves with love and caring! Sometimes I’ve heard my inner dialogue to myself and I know that I would never speak that way to my friend…so critical and not friendly at all! So one of my resolutions this year is to speak to ME as I would to my friends…with love, caring and kindness. Because we must celebrate our strengths, let them glow and show and share those unique gifts we each have ~ connect with others who are like-minded and rejoice in who we are! I may not be your idea of beautiful on the outside, which is fine by me…but I hope that my inside beauty shines through to you. Let your inner beauty shine through to others! You have so much to offer ~ please share your uniqueness today! Thank you for sharing your uniqueness with all of us! It shines through you!